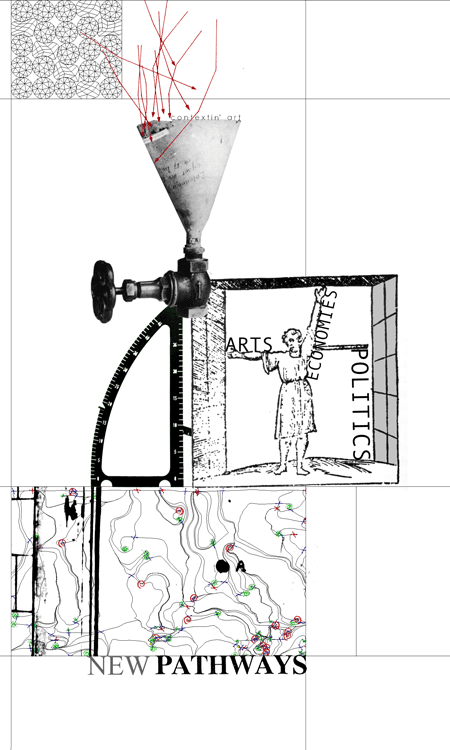 Artofficial Construction Media (ACM) announces the premier issue of 'Contextin' Art,' an online zine for the exploration of the political economies of new media art. This issue contains several projects that provide pathways to the system of linkages between information technologies, cultural production, and social infrastructures. Contextin' Art is a mini-portal for the exploration of the context of art through art. The economic, political and social forces shaping the histories of art are visualized as artworks themselves. With 'Contextin' Art', visitors can visually browse the often invisible relationships between art, electoral politics, and economic philanthropy. Contextin' takes cues from previous generations of artists engaged in 'institutional critique' and 'conceptual art,' as well as calls from contemporary artivists to interrogate the desire for 'techno-formalism' within institutions. Being the first issue, they have organized it around the general theme of their mission, the contextualization of New Media Art within current political economies. Each of the works included deals with viewing New Media culture within a specific political economy. >from *Contextin’ Art site* April 1, 2003.